Summer is the absolute favorite time of the year for many students, for obvious reasons! Growing up, my summer memories are filled with lazy summer days, playing in the woods near the creek, mowing lawns, drinking grandma's sweet tea, family road trips, camping and bonfires. Summer time is still my favorite time of the year! But for many students, summer is filled with hours in front of the tv, with no real productivity. This lack of a mental challenge creates what educators call the "summer brain drain" or the "summer slide". The summer slide is the nickname for when students go through summer vacation without any academic or mental challenge the way they were challenged throughout the school year. This lack of mental challenge actually harms your child's educational skill set to where they will start the next school year further behind in their knowledge and writing abilities. That is why I highly encourage students to stay mentally challenged every day throughout the summer! The absolute best way to help your child maintain their academic skills while keeping them mentally challenged is through writing! Side Note! Reading is also SUPER important! Encourage your child to read at least 30 minutes a day! Make a commitment to taking them to the library once a week. Take them. Just do it. Interested in a 12 week summer writing program for your teen? Click the button below to find out all the deets! Step 1. Grab a notebook and pencil for your teen. I recommend getting them a composition notebook that is solely for summer creative writing. Step 2. Either let your teen choose a topic that interests them, or give them an intriguing topic that will get them thinking creatively. Step 3. Take 5 to 10 minutes just to brainstorm. Let your imagination run wild before you put pen to paper. Step 4. Set a timer for 30 minutes. Have them write until the time is up. Here is the 7 Day writing challenge for your teen! Day 1: What can you do this summer to make this the best summer ever? Day 2: What are you passionate about and how can you improve your skills to pursue that passion? Day 3: What determines an action or person as good or evil? Who gets to decide what or who is good or evil? Day 4: Describe your happiest child hood memory. Day 5: What event in your life has caused the most anger? Or what has caused you the most raw emotion? Day 6: Describe the best meal you ever ate. Day 7: If you could write your own book, who are the main characters, and what is the plot? 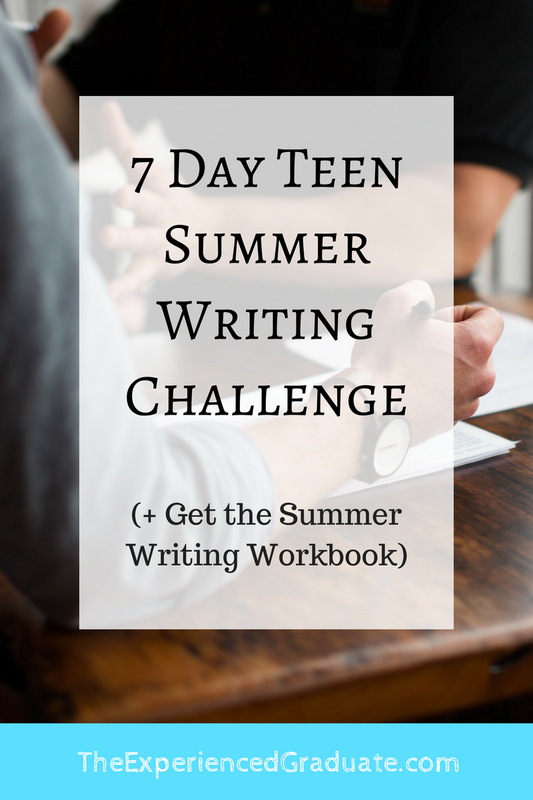 Most website writers would make you sign up to receive this 7 Day teen summer writing challenge. But I believe so strongly in having your child write every day, that I want you to have this challenge and get motivated to starting your child with their summer writing! I want your child to have the tools and resources to start the next school year off on the right foot! If you are interested in a 12 week summer writing program for your teen, click the button below to find out more! This program will definitely help your child kick start their creative writing skills!